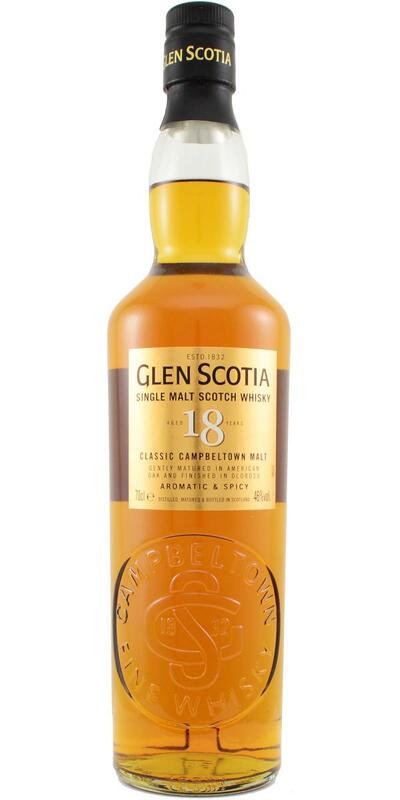 Summary: I enjoyed, this Glen Scotia gave me a lot of saddle and probably thanks to maturing in oloroso sherry barrel it left a significantly better impression than the once tasted classic 18 yo from the series with cattle. A shot number 2 at the Whisky Festival in Radebeul 2019. 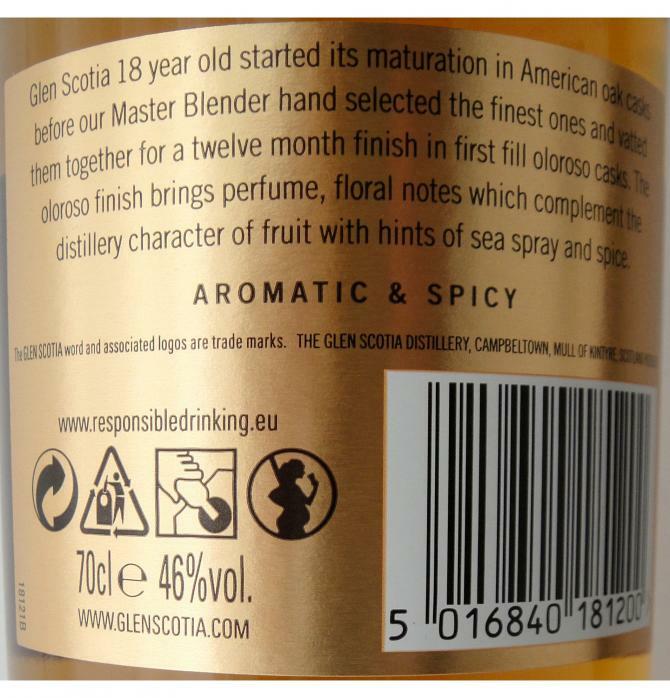 Great expression from Glen Scotia. They do have a high Standard (except for the Double wood which not worth calling by name). I’d say in the GS core range Victoriana is the best for me, this 18 comes in very close as 2nd and the 15yo is at a decent 3rd place. Rich and mature. Fresh Mint leaves And quite perfum-like. Coastal, salty character accompanied with a hint of sherry wood, green herbs and sweet dark fruits. Well balanced at 46%. No water needed. Smokey and salty. clear hints of Bourbon with quite a big edge of oloroso sherry. Red fruits. And a slight minty mouthfeel. The Glen Scotia spirit is still there. Clearly which is a very good thing! A long, pleasant, sticky finish. Slightly pepery and dry. Aged wood and again that coastal salty character with a hint of (peat)smoke. This bottle was my contribution to the Loch Lomond Group tasting I had with my friends. 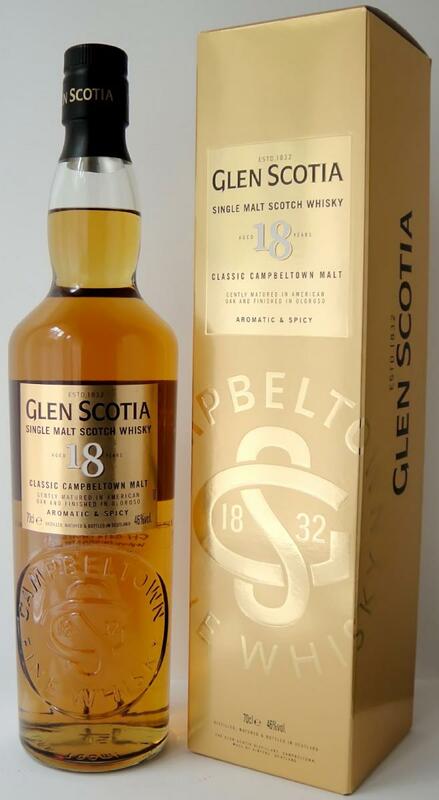 The quality of the Glen Scotia compared to the GS 15y, made me modify my score for the Glen Scotia 15y from 87 to 86. 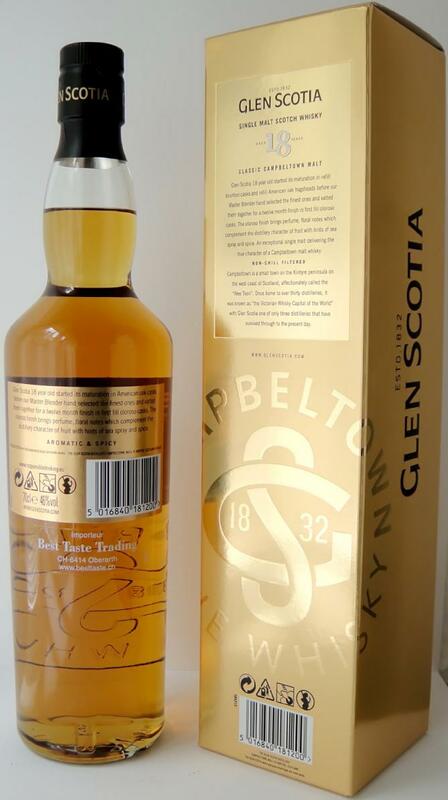 The Glen Scotia is in all aspects much more mature. Coastal smell, fruits, more spicy compared to the 15y. Fruits, vanilla, good body. Oily, waxy. Medium long and nice. In the very end a touch of smoke. Very decent whisky. Can you drink well? But now nothing that imposes itself as a purchase candidate. But I would not refuse, if he is offered to me. He is set as the 15er. But still has a certain freshness. The fruits are a bit yellow. Glazed yellow apple in butter. Physalis. In addition a clear citrus note, which I describe with lemon cake. Vanilla and charcoal. Pretty oily. Reminds me a bit of the very juicy and delicious Eierlikörkuchen (there comes a lot of oil) my mother. With some apricot jam. Take 2 orange drops. Now a little ginger. After that, it gets a little more acidic. Grapefruit. Milk with a lot of unsweetened cocoa. It is getting drier. Some grass. Nose: sweet, leather, vanilla, salt, spices, oak, grass, sweet fruits, furniture varnish, cake and olive oil. Mouth: sweet fruits, salt, spices, oak, pepper and chocolate. Finish: long with spices, vanilla, chocolate, dust and smoked salmon closer to the end. 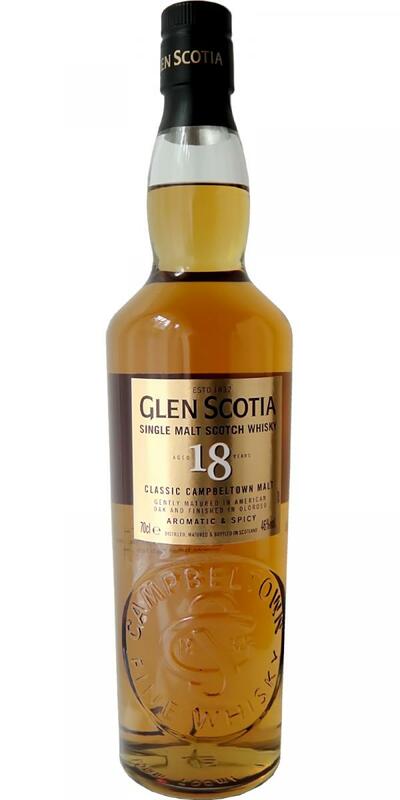 Glen Scotia 18YO is a good balanced, complex and interesting whisky for thoughtful drinking. 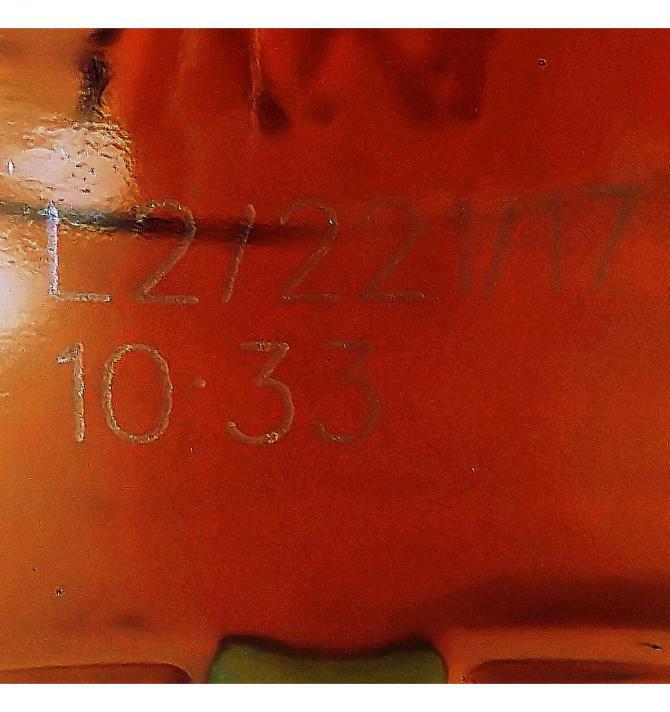 Great OA with age, 46% and not cool filtered. That brings intense notes and neat spice. However, the wood is quite dominant and you have to like that - especially in the finish. Fresh (slightly salty sea air and lemon), fruity (pear) and honey-sweet, caramel biscuit, malt, light smoke and earthy notes. The oak also taps with sharp wood notes and herbs. Crunchy, tingling and woody. Malt coffee and a lot of chocolate, some salt caramel, vanilla and some pepper and herbs. First chocolate again, then lots of pepper, menthol and bitterness, plus honey sweetness and licorice. Medium long and on the woody side. Who knows the 15er has nothing here. He is round and fruity. Has a slightly smoky touch but can not do anything better than the 3 year younger brother. On the contrary, here I had a slight bitterness. At 15 there was nothing to feel. Delicate vanilla honey with straw and tobacco in the background. Very good to smell are the citrus notes but also the apple Helene speaks up. Is there a sea breeze? or even some bitter wood notes? Difficult to make out. The nose is very reserved. Spicy peppery with oily oak sweetness it starts on the palate. Apple Helene and a hint of vanilla consolation over the slightly bitter wood. Somewhat sharper than the nose and slightly salty (imagination). Behind the nutmeg comes some tobacco and new leather to advantage. Already delicious. Medium to long and extremely spicy peppery (me too much) he logs off with dark chocolate in the coffee slowly. He loses the comparison to the 15er with me clearly. But still a good malt. Especially in the PLV!